I walked over to downtown Boise's Julia Davis Park late yesterday afternoon while my daughter was at choir practice, and this creature gave me a start. It's a fox intent on stalking squirrels. He went right past me fast and didn't even glance at me. 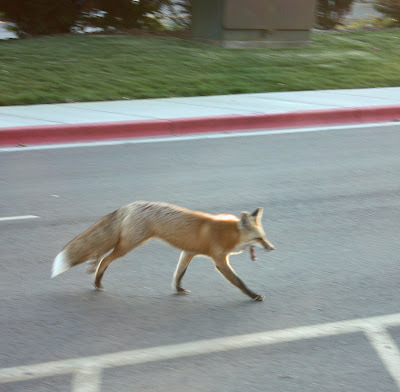 "Zoo Boise" is in the park, could this fox be an escapee? That is so amazing! To come across a fox in the middle of the street!!! Whoa! How cool is that?! We see coyotes, never foxes. Good thing you've always got your camera at the ready Diva. Oh how cute!! We have coyote's that come into town sometimes. Ya there's at least one resident fox in Ann Morrison so it's not unheard of. Wow! You must have moved fast grabbing that photo! You were lucky to have seen him. That's not an everyday thing seeing a fox walking through town! That would sure catch your attention alright. Something we aren't used to seeing in town.